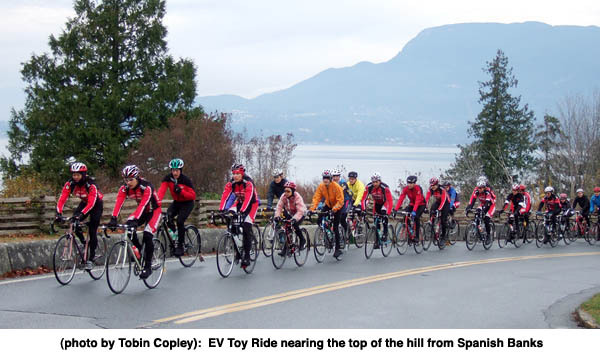 On Saturday November 24, 2007, over fifty cyclists braved cool temperatures and icy roads to join Team Escape Velocitys annual Toy Ride, raising $1440 for the Lower Mainland Christmas Bureau. The Lower Mainland Christmas Bureau, a Vancouver based charity, provides food vouchers and toys for low income families in Vancouver. Starting from picturesque Jericho Beach, the Toy Ride followed Escape Velocitys regular Saturday morning club ride route through Point Grey and around Richmond, with a side trip to Iona Beach. Riders who completed the 90-plus kilometer ride enjoyed warming temperatures and sunny skies as the ride progressed. At the end of the day Saturday, $1440 in cash and few gifts were dropped off at the Lower Mainland Christmas Bureau. The donations were much appreciated by the staff at the LMC. A titanium ring draw prize, donated by Steve Fenning, was won by Brandon Edwards. Special thanks to Tim Hortons Community Cruiser for providing hot coffee and Timbits at the start of this event.